Garmin's greatest GPS watch yet? If you judge quality based on how many versions we've seen, the Fenix 3 is definitely up there, now sporting HR, Sapphire and Chronos variants. 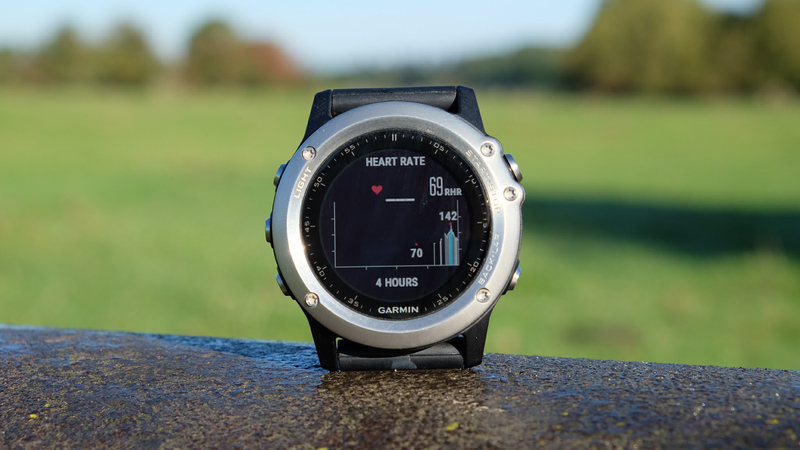 But it's the Fenix 3 HR we've been playing with to see if that wrist-based heart rate – along with all the other Garmin smarts – make this the sports watch to go for. The Garmin Fenix 3 HR certainly isn't cheap at around $599 for the gray/silver base model. It's not light either at a hefty 82g and it's not small, standing 16mm off your wrist. All that said, it's not lacking – this device crams in so much tech it would have taken up an entire room a few decades back. So is the Garmin Fenix 3 HR packing enough to stand up to the competition from the likes of Polar, TomTom and now even Apple? Read on to find out. If the Garmin Fenix 3 HR was standard issue for the military we wouldn't be surprised – it's really, really rugged. Chunky build, visible screws and metallic finishes aside this is somehow still a very attractive GPS watch. You can wear this day to day with pride as it straddles the line between geeky and large, almost-poser-level watch. The only issue is that you'll have a job keeping it tucked under a sleeve, so be sure you're ready to show it off before you strap this on as you head out to a date. For die-hard Apple fans, the addition of GPS to the Apple Watch Series 2 could get them splashing out on its squarer design, although the Apple model is still lacking a lot of other sensor and metrics smarts compared to this beast. One thing you won't have to worry about is comfort. This is ideal for when you're training, as the slightly stretchy silicone strap fits perfectly. That means you'll get the best position on your wrist for the heart rate monitor to work effectively, without it being so tight you have to amputate your hand when you get home. That said, it is a little weighty. You will notice this watch. If you're looking to run a marathon it may even be a factor for carrying extra weight. But for the sports it's aimed at, such as hiking, skiing and paddleboarding, it's fine. Although we found paddleboarding with a wetsuit meant no heart rate as it had to be worn over the wetsuit sleeve. When it comes to multi-sport tracking you'll be hard pressed to find a watch with more on offer than the Fenix 3 HR. This works for – deep breath – running, cycling, swimming, skiing, hiking, paddleboarding, golf, rowing, hunting, fishing, the gym and more. If that list isn't exhaustive enough you can even make up your own by picking the data screens you want. While the Polar V800, by comparison, can do the full triathlon training tracking and looks good too, it still can't offer as much as the Fenix. The many sensors in the Fenix 3 HR go a long way to making it the impressive all-action watch it appears to be. Ready for another list? This packs in: motion sensors, a barometric altimeter, electronic compass, heart rate monitor, ANT+, Bluetooth, Wi-Fi and more. All that equates to a good investment as the watch is ready for anything, and with software updates could do even more in the future. Plus the Connect IQ Store means more and more apps are appearing for it all the time – it's even got games now. Built-in metrics are also useful. We found that the sunset times, based on your location, were a great help, especially when hiking and deciding a time to pitch the tent before dark. Since the data fields are all changeable you can set up your run, ride, row or whatever with the exact screens you need. This really makes all the difference when creating a personalised device that offers everything you need for that type of training at a glance. There are also extra Connect IQ Store apps that cram in more data fields so you can see even more, right there on the face. Wrist based heart rate monitoring is always going to be a point of contention. The great thing about this is that if you want super accurate tracking you can always connect a chest worn strap and measure heart rate from that. So that's one option. Otherwise it's nice to have a guide for heart rate training everywhere you go. This is the most major change between the previous Fenix 3 and the Fenix 3 HR so it's worth noting what that adds. One advantage of the wrist heart rate monitor is the ability to quickly go for a run or ride without carrying any extra kit. You can then train within heart rate zones for active improvements. Sure, the bpm might not be exact, but if you're moving up and down by training in zones, that doesn't strictly matter that much anyway. That said we found heart rate tracking was accurate, but occasionally showed lag when compared with a chest strap, if jumping between intense and less heavy sections of running or cycling. For swimming it won't work at all as it's simply not accurate enough, and Garmin says you'll need a chest strap to track HR in the wet. For day to day tracking the optical monitor is smart enough to turn on and off based on motion sensor data. The more you're exercising the more regularly it'll check heart rate, so saving on battery but still offering a fairly regular baseline heart rate during the day and night. When out on a long cycle ride the watch sits still so the heart rate data is fairly accurate. It works well enough to zone train and when you overlay heart rate and elevation graphs it gives a great view of just how hard you've pushed yourself. Another positive to having heart rate on the wrist is the ability for apps to leverage that data. Using HR with other data can create a clearer picture of how you're performing. Again the highest levels of accuracy are not needed and this allows Connect IQ apps the chance to invent even more creative uses for the Fenix 3 HR. Daily activity tracking has been something Garmin has offered for years now, so you know it's going to be accurate. That's not the problem here; it's the watch size. It takes some getting used to so wearing it every day might not be easy at first – let alone at night for sleep tracking. The step and sleep tracking is all automatic so you don't need to do anything other than leave the watch on. During the day you can have alerts to avoid stagnation and the standard watch face offers Garmin's red bar that builds as you stay still. Thanks to an impressive battery life, leaving the tracking on isn't really a worry either as it makes very little difference. So if you want it, the options are there and they work well. Sleep tracking was fairly useful, with deep and light sleep variations. We happened to be using a dedicated sleep tracker at the same time though (the ResMed S+) and noticed a pretty big difference in data. So while the sleep tracking is there as an extra, it's more of a rough guide. Activating Bluetooth to sync to your smartphone is fine as it doesn't really affect the battery of either device to any large degree. The problem here is that Garmin now requires you to turn on location services on your phone if you want the devices to connect – which can affect smartphone battery. So if you are connected you can be alerted to calls, messages and even WhatsApps, plus you can read the messages. The ability to switch notifications off while exercising, to avoid interruptions, is also nice. But that location requirement on the phone made it useless for us as we like to keep that turned off to save battery – unless needed for checking a map, for example. Garmin has been using the same Connect app across its devices for some time now. It's also had the Connect IQ Store up and running for long enough to be full of fun and useful apps created by Garmin and by users themselves. The result is a well-formed base to plan, track and analyse your training from. At the top level you can glance at data to see your last workout, activity and sleep. Then you can drill down deeper to see details like heart rate spikes in relation to altitude or cadence, for example. It's all largely open to manipulation so finding your exact metric is easy enough. Our niggle? There's too much. Garmin throws all its devices and app offerings into one place so it ends up feeling a bit overwhelming. While we largely ignore a lot of the menu options, like Golf, Gear, Segments, Groups, News Feed and more, they're still in there alongside everything else. It feels like Garmin could streamline this, a lot. It has the potential to become perfect, but to reach that it'll need to be cut into shape and customisable. All that said, the Connect IQ store is great for apps such as a Back To The Future watch face, a gravity game that uses the watch's sensors to make it a controller, a face that shows you the stars above you as you turn and plenty more. When it comes to matching those tough looks with rugged performance, the Fenix 3 HR lives up to what you'd expect. Garmin says it'll go for two weeks in smartwatch mode, 40 hours in UltraTrac training mode and 16 hours on pure GPS mode. Our experience can't argue with those figures. Even with Bluetooth, heart rate and Wi-Fi all left on, the watch still just keeps going. With a few GPS training uses, plus activity tracking and notifications turned on, the battery lasts the week no problem. It's just the need to leave location turned on in your connected smartphone that can cause battery woes on that side. Of course if you're going out for 30-mile bike rides several times a week the juice will get drained faster, as opposed to non-GPS related uses. But having that full week without much worry about charging is a nice touch. Especially when you consider that it needs a dedicated charger cradle, albeit one that's USB friendly so you can use most plugs and computers. This is what GPS watches are all about: tough, long lasting, accurate and full of sensors. It now looks good enough to wear day to day, works as an activity tracker for 24/7 use plus offers enough notifications that can be read to actually be useful as a smartwatch. It falls down on small things like being slightly too heavy and large for some and having an app that tries to offer too much at the cost of over-complication. Nothing that’ll hinder its main purpose of tracking sports then, but since Garmin is clearly aiming at making this a day-to-day watch too, that size issue needs to be taken into account – especially when Apple is now nipping at Garmin's heels. All in all this is an excellent GPS watch, a capable smartwatch alternative with worry-free battery and good looks. The addition of heart rate makes for deeper data analysis and use that helps futureproof the Fenix too.